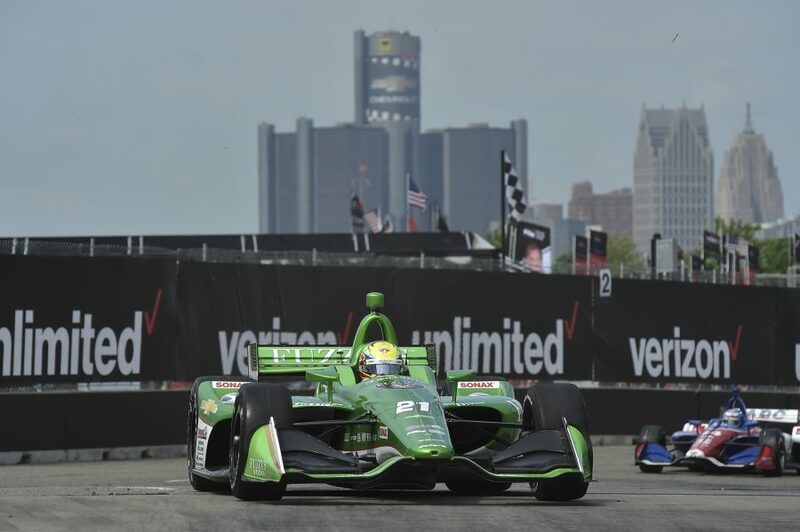 – After putting forth his best street course qualifying effort to date this morning, Spencer Pigot followed it up with his first Top 10 finish of 2018 in this afternoon’s Race 1 of the Chevrolet Dual in Detroit. – Unlike knockout qualifying at other street courses, qualifying for the Duals would see the field split in half with both groups getting a 12-minute session. The fastest driver overall would be awarded the pole position, while the rest of the drivers from that group would fill out the odd-number spots. Pigot was in Group 1, finishing the 12 minutes in the 6th position. Marco Andretti from Group 2 would win the pole, assigning Pigot to 12th on the starting grid for Race 1. – Pigot elected to start the 70-lap race on Firestone’s red alternate Firehawk tires. He gained two positions on the opening lap, moving from 12th to 10th. Pigot stayed on the same strategy as the leaders, thus being a two-stop race. He had cycled up to 6th before making his first stop on Lap 23. After struggling for grip on the red tires, he switched to black Firehawks for his second stint. As Pigot went to leave the pit box, the engine on the No. 21 stalled. The Fuzzy’s Vodka crew immediately re-fired the car and Pigot was away. Even with the stall, Pigot would only lose one position and cycled back into 11th place. – A hard-charging Robert Wickens was able to get by Pigot and several other cars after the Lap 53 restart, dropping Pigot to 10th. Another caution came out for Laps 56-59, setting the stage for another restart on Lap 60. Wickens’ teammate, James Hinchcliffe, was directly behind Pigot for the restart. However, Pigot had used his push-to-pass conservatively throughout the race and had more than enough to be able to stay solidly ahead of Hinchcliffe in the closing laps. Pigot would finish 10th, his first Top 10 of 2018. – Ed Carpenter Racing will return to Belle Isle race course tomorrow morning to prepare for Race 2 of the Chevrolet Dual in Detroit. Tomorrow’s race will be an entirely new event, with another qualifying session taking place at 10:45 a.m. ET and the green flag for Race 2 falling at 3:50 p.m. ET. ABC will broadcast the event beginning at 3:30 p.m. ET.